McLeod is located in north Edmonton within the Casselman-Steele District Outline Plan area. The neighbourhood is bounded by 153rd Avenue to the north, 58th Street to the east, 144th Avenue to the south, and 66th Street to the west. McLeod is surrounded by residential neighbourhoods on all sides and is well connected with arterial roads that facilitate easy access for residents to other parts of the city. Residential construction in this neighbourhood was well under way in the 1950s, and McLeod was almost entirely built out by 1980. 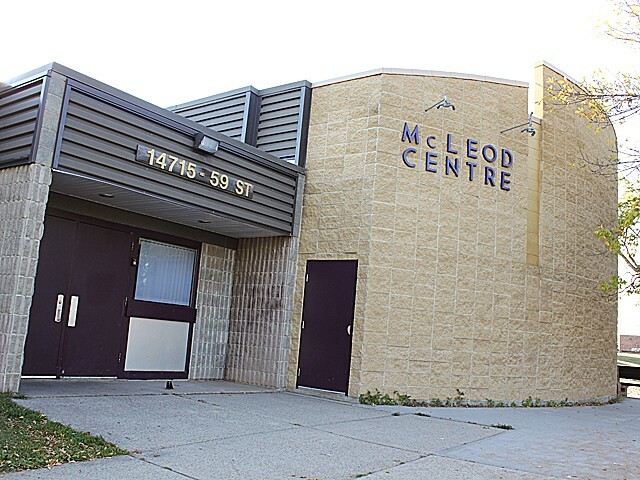 Like most suburban neighbourhoods of its time, land use in McLeod is primarily dedicated to residential purposes. 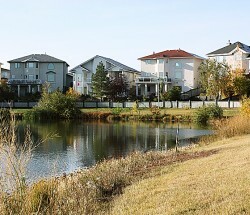 Unique to McLeod is the fact that almost all of its residential properties were developed as single-detached dwellings. Most of these housing units were built during the 1960s, with higher density infill development occurring during the 1970s. McLeod’s design is typical of the time in which it was subdivided. Streets are laid out in crescents and cul-de-sacs, and its residential lots are of a generous size. 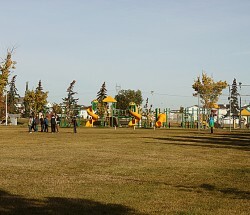 Schools in most neighbourhoods are centrally located, but the four schools in McLeod are situated along the southeast perimeter of the neighbourhood. 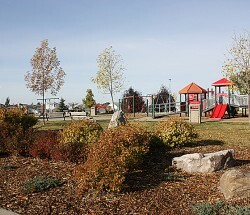 In this location, the school and parks sites serve not only the children of McLeod, but also those of adjacent neighbourhoods, such as Casselman to the east. This neighbourhood was named after Murdoch McLeod (1844–1930), an early pioneer who arrived in Canada from Scotland after signing on with the Hudson Bay Company in 1861. McLeod spent six years in the Arctic, was held prisoner in Manitoba during the Riel Rebellion, and moved to Edmonton in 1879 to farm in the Belmont area. North Edmonton Alliance Church, 5108 McLeod Rd. Steele Heights Baptist Church, 5812 149 Ave.
Christ the King Lutheran Church, 13111-79 St.
Clareview Bible Church, 5707-159b Ave.
Clareview Pentecostal Assembly, 4925 134 Ave.
Emmanuel Community Reformed Church, 6505 140 Ave.
First Christian Church Edmonton, 13407 97 St.
Masjid Al Omari (Edmonton Islamic Center), 6502 137 Ave.
Jordan Chiarello, 21, was born and raised in McLeod with his mother, father and older brother in a bungalow on 65th Street. He describes McLeod as an awesome neighbourhood full of kids. He attended St. Dominic Elementary, J. J. Bowlen Junior High School and Archbishop O'Leary Catholic High School where he was active in sports. During his school years, he said all his teachers were excellent, treating him as an individual student, rather than just a number. He was also a regular at the Londonderry Leisure Centre where he is often found using the pool, gym, tennis courts and playing fields. All his family continues to live in McLeod including his brother, grandmother, aunts and cousins. 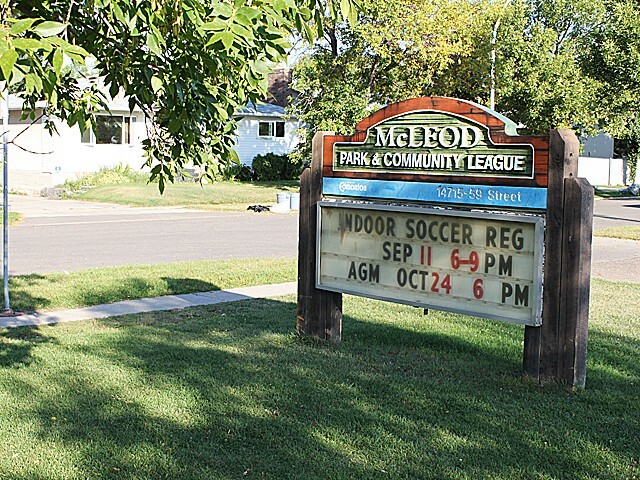 The neighbourhood is well served by the McLeod Community League, located within McLeod Centre at 14715 59 St. in McLeod Park. Some of the community league recreational activities include a wide range of yoga programs, dancing, and drama. Sports include softball, kickboxing, baseball, soccer, hockey, basketball and free community swimming sessions at several public recreation centres. Londonderry Fitness and Leisure Centre, at 14528 66 St., features a variety of aquatic and dryland experiences for all ages and abilities. Workout in the large fitness centre or take classes in the aerobic fitness studio. Londonderry Arena, at 14520 66 St., is the venue for public skating, figure skating and hockey. 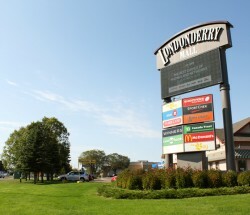 The Londonderry Mall, at 137 Ave. and 66 St., is a mid-sized regional shopping centre opened in 1972 now featuring more than 140 stores including the Hudson’s Bay, Army & Navy, Winners and Save on Foods. The mall is also the location for the Londonderry branch of the Edmonton Public Library. Little Einsteins Daycare, located within St. Dominic Elementary at 5804 144 Ave., is a privately owned day care with other centres throughout the city. McLeod School, at 14807 59 St., is a public elementary school that incorporates the philosophy of Steven Covey’s 7 Habits of Highly Successful People into its school culture. Steele Heights Junior High, at 14607 59 St., describes itself as a community school that draws students from numerous elementary schools, especially York and McLeod elementaries. J.J. Bowlen, at 6110 144 Ave., is a Catholic junior high school of approximately 500 students located across the street from St. Dominic Savio Parish. St. Dominic Elementary School, at 5804 144 St. NW, is a K-6 Catholic elementary school with a wide range of programs. M.E. Lazerte School, at 6804 144 Ave., is a public high school with a full International Baccalaureate diploma program as well as programming in Chinese and Ukrainian Language Arts and the Interactions Program. The school also offers courses in international languages, the arts, Career and Technology Studies, Knowledge and Employability and physical education. Londonderry Junior High School, at 7104 144 Ave., is known for its excellence in student conduct and citizenship. The school’s Mandarin Bilingual program enjoys an excellent reputation because of its rigorous language development work and successful alumni. John Barnett School, at 14840 72 St., offers regular programming for students from K-6. Students with special needs are integrated into regular classes. Edmonton Christian School, at 5940 159 Ave. NW, offers a Christian education for grades K-9. There is also a preschool for four-year-old children.